There are so many things happening on the farm right now that it’s hard to keep up with them all. Seedlings going out, new seeds coming in, prep for our April weddings, propagation of dahlias and mums, summer planting planned, cover crops tilled under, perennials top dressed and mulched, branches cut for forcing, barns mucked out and spread in the field, and everything everywhere turning green. The first daffodils have bloomed, and the first dandelions were hot on their trail. In the next week, we should see some of our heirloom varieties of narcissus emerging. Exciting! 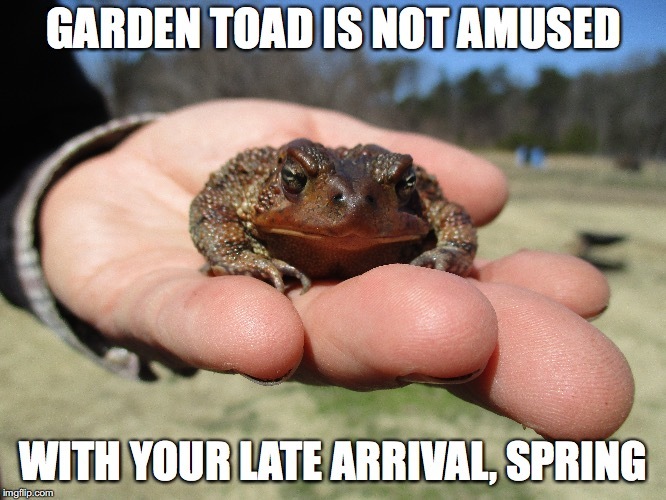 And in keeping with our recent theme of animals who are not amused, we think this toad sums up how we are feeling about March.